Eyegaze Edge enables locked-in users to communicate with the world via robust, accurate eye-tracking devices and software. 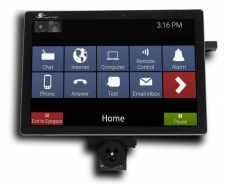 Eyegaze Edge the world’s most advanced eye-driven tablet communication system. Internationally trusted and locally loved, our Eyegaze Edge continues to be the device of choice by locked-in users and their SLPs. Made by LC Technologies.